The role of intention, i.e., "intending to do what the Church does in the administration of a sacrament" has been used by the Society of St. Pius V (SSPV) to attack the consecrations of Archbishop Thuc. Some Thuc bishops and their priests casts similar aspersions against the consecration of Bp. Kelly of the SSPV by Bp. Mendez. And, of course, there's the old charge that Abp. Lefebvre was neither bishop nor priest due to his ordaining/consecrating bishop (Cardinal Lienart) lacking proper intention for being an (alleged) Freemason. It is unquestionable that the Church requires proper intention for a sacrament to be valid. Unlike the matter and form, which can be readily detected, the intention of the sacrament is not as easy to discern. What is a proper intention? What makes it defective? How does it apply to various cases, and to the Vatican II sect's sacraments? These are the questions I will seek to answer in this post. In American civil law, there is something called mens rea, i.e., "mental state" which is necessary for legal culpability. For example, in order to be found guilty of murder, the prosecution must prove beyond a reasonable doubt that the accused intended to kill the person. If the intent was lacking, even though the physical act resulted in the death of a person, the accused would be found not guilty. The physical act must be accompanied by a mental state in order for the crime to be committed. There is a debate as to whether an external intention is sufficient. To seriously perform the outward ceremony, but not to have a corresponding internal intention to do what the Church does, is considered insufficient by the unanimous opinion of the theologians since the 13th century. (See De Salvo, Intention of the Minister of the Sacraments, CUA Press (1949), pg. 92). This is the logical result of # 1 above. The minister performs the sacrament "in the person of Christ" Who is without sin. The priest consecrates the host saying "This Is My Body," not "This Is Christ's Body." 3) Is Having the Proper Intention Easy to Discern? Yes. A "virtual intention" to perform a sacrament is all that is required. Without getting into the technicalities of a "virtual intention," the Church teaches that it “is certainly present in someone who regularly performs sacramental actions.” (See theologian Coronata M. Conte a Coronata, De Sacramentis: Tractatus Canonicus (Turin: Marietti 1943) 1:56) The mere act of putting on vestments and going to the altar is considered sufficient evidence for virtual intention. As Pope Leo XII stated in Apostolicae Curae, declaring Anglican Orders "absolutely null and utterly void," "The Church does not judge about the mind and intention in so far as it is something by its nature internal, but so far as it is manifested externally, She is bound to judge concerning it." 5) When is an Intention Defective? When the minister has a positive contrary intention, "I do not intend to (baptize, ordain, confirm) this person"
It is easy to see that formulating a necessary intention for validity is not difficult when you have a valid minister of the sacrament who seriously sets about to perform the traditional pre-Vatican II rite. There are witnesses and photos showing Bp. Mendez performing the rite of episcopal consecration on Fr. Clarence Kelly. He never manifested a positive contrary intention, and was not declared insane. 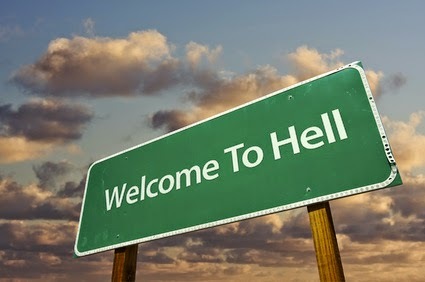 Ditto for Archbishop Thuc and Cardinal Leinart. In the Vatican II sect, an argument has surfaced that the Novus Bogus "mass" may now be valid. Apologists for the sect have stated that since 2011, when they changed the words consecration of the wine back to "for many" (instead of "for all"), there can be no more doubt as to validity. Not quite. Most of their priests are invalidly "ordained" in the Pauline Rite of ordination making them laymen. It doesn't matter what form they use if they are not priests. Furthermore, the words "the mystery of faith" were not restored, and many theologians believe them to be integral to the form. However, let's assume that an elderly priest who went along with the Vatican II sect in the 1960s (ordained in the 1950s) is of sound mind. Let's further assume that he uses the complete, correct form of the consecration in English during the New "mass." We have a valid mass, right? NO! Here we would have a defect of intention! How, you ask? In 1969, The General Instruction on the Roman Missal (GIRM) replaced the "Words Of Consecration" with an "Institution Narrative." Deploring Traditional Catholic theology, and scholastic philosophy, the Modernists don't like "magic words" that effectuate "myths" like transubstantiation. Rather, the whole "Eucharistic Prayer" (replacing the Sacred Canon) now causes the Body and Blood of Christ to be present--present insofar as the bread and wine no longer signify the same role (the heresy of transignification). In 2001, the Congregation of the Doctrine of the Faith headed by Ratzinger, approved as valid a "mass" by schismatic Assyrians that contains no words of consecration! (See "Guidelines for Admission to the Eucharist between the Chaldean Church and the Assyrian Church of the East") The document approved by Ratzinger claims that "the Words of Eucharistic Institution" are contained "in a dispersed euchological way, that is, integrated in successive prayers of thanksgiving, praise, and intersession." This statement overthrows EVERYTHING the Church has taught about sacramental forms. Also in 1969, Cardinal Ottaviani issued his famous Ottaviani Intervention against the New "mass." On page 44, it states: "All this, in short, changes the modus significandi of the Words of Consecration--how they show forth the sacramental action taking place. The priest now pronounces the formulas for Consecration as part of an historical narrative, rather than as Christ's representative issuing the affirmative judgement This is My Body. (Emphasis in original) Pre-Vatican II treaties on invalidating defects that occur in the form of the sacrament of the Eucharist, insist that the Words of Consecration must not be recited as part of an historical narrative. According to the pre-Vatican II principles of sacramental theology, the recitation of the form as part of a narrative is an external manifestation of a defect of intention (See principle # 5 above) The priest, using a rite alien to the Church (Novus Bogus) recites the words as part of an historical narration. In the True Mass, the priest must pause before reciting the Words of Consecration, and then (bending over the host/chalice to be consecrated) pronounce them distinctly, attentively, and secretly (just loud enough for him to hear). This manifests the intention to effect transubstantiation in the here and now by virtue of his sacerdotal power. In the Institution Narrative, he simply recounts what took place nearly 2,000 years ago, and manifests a contrary intention--a defect theologian/rubrician O'Connell discussed. Traditionalists should stop questioning unnecessarily the intention of alleged "Masonic bishops" and start questioning the intention of everything Vatican II. Those intentions are defective, invalidating, and downright evil. On the feast of St. Joseph, March 19, 2015, Bishop Richard Williamson consecrated Fr. Jean-Michel Faure as a new Traditionalist Bishop. Pseudo-Traditionalist is more accurate. Bp. Williamson was one of the four priests consecrated by Archbishop Marcel Lefebvre in 1988 for the Society of St. Pius X (SSPX). The position of the SSPX has always been a rejection of sedevacantism and sedeprivationism. They hold the "recognize and resist" idea that you can recognize the post-Vatican II "popes" as legitimate Vicars of Christ, and yet "resist" their errors. In 2012, Bp. Williamson was expelled from the SSPX for his criticism of General Superior Bp. Bernard Fellay in his efforts to reconcile the SSPX to the Modernist Vatican. In reaction to Bp. Fellay's "dialogue" with Rome, Williamson founded the Society of St. Pius X of the Strict Observance (SSPX-SO).
" We have a Mandate to consecrate from the Roman Church which in its fidelity to Sacred Tradition received from the Apostles commands us to hand down faithfully that Sacred Tradition – namely the Deposit of the Faith – to all men by reason of their duty to save their souls. By this handing down of the episcopal power of Orders, no episcopal power of jurisdiction is assumed or granted, and as soon as God intervenes to save His Church, which has no more human hope of rescue, the effects of this consecration and of its emergency Mandate will be without delay put back in the hands of a Pope once more wholly Catholic." You might ask, "How does this jive with the "recognize and resist" idea that Francis is pope? Answer: It doesn't. Bp. Williamson continuously makes gratuitous assertions without one iota of theology and canon law to back them up. Everything he does runs strictly counter to what the Church teaches through Her approved theologians. "The Church's infallibility extends to the general discipline of the Church. ...But if the Church could make a mistake in the manner alleged when it legislated for the general discipline, it would no longer be either a loyal guardian of revealed doctrine or a trustworthy teacher of the Christian way of life." (Dogmatic Theology 2:114-115; Emphasis in original) Therefore all of what the Church legislates with papal approval is infallible; it cannot be evil or in error. Now, let's consider the "mandate" of Williamson when analysed under these principles. Para. #1: We have a Mandate to consecrate from the Roman Church which in its fidelity to Sacred Tradition received from the Apostles commands us to hand down faithfully that Sacred Tradition – namely the Deposit of the Faith – to all men by reason of their duty to save their souls. The Roman Catholic Church acts through Her visible Head, the pope, under normal circumstances. How can you get a mandate from the Church when you recognize Francis and he has not consented to give you one? Are you suggesting the pope gave something evil? See principle #2 above. Para. #2 For indeed, on the one hand, the authorities of the Church of Rome from the Second Vatican Council down to today are driven by a spirit of modernism which undermines in depth Sacred Tradition to the point of twisting its very notion: There shall be a time when they will not endure sound doctrine, turning away their hearing from the truth, turning unto fables, as St Paul says to Timothy in his second Epistle (IV, 3,5). What use would it be to ask such authorities for a Mandate to consecrate a bishop who is going to be profoundly opposed to their most grave error? The authorities--including the man they consider "pope" is in "grave error" that needs to be opposed? See principle #2 above. The Holy Ghost would not permit the pope to teach a "most grave error" and to be driven by "a spirit of Modernism" which is heresy. Para. #3 And, on the other hand, to obtain such a bishop the few Catholics who understand his importance might have hoped, even after Vatican II, that he could come from the Society of St Pius X founded by Archbishop Marcel Lefebvre, like the four consecrated for them in 1988 by a previous emergency Mandate. Alas, when the authorities of that Society showed by their constant turning towards the Roman authorities that they were taking the same modernist road, that hope proved to be vain. Lefebvre made up a "mandate" too! Salvation came not from the pope and his hierarchy with ordinary jurisdiction established by Christ, but through the SSPX set up in opposition to the appointed hierarchy! Now they "defected" by----wanting to be united to the pope?? Para. #5 By this handing down of the episcopal power of Orders, no episcopal power of jurisdiction is assumed or granted, and as soon as God intervenes to save His Church, which has no more human hope of rescue, the effects of this consecration and of its emergency Mandate will be without delay put back in the hands of a Pope once more wholly Catholic." You mean we have a "partially Catholic" pope? Sounds like Vatican II ecclesiology! Doesn't Williamson reject the idea of non-Catholic sects being in "partial communion" with the Catholic Church ---as the heretical teachings of Vatican II tell us? Yet it seems Mr. Bergoglio can be in "partial communion" with the office of the papacy! Bp. Williamson, and the newly consecrated Bp. Faure are of a Protestant mind- set. They recognize a man as pope, then apply their own made up principles (alien to the Catholic Faith) to justify doing what they want. Then they go about as they please in the hopes that some day Bergoglio (or his successor) will do what they think is right. How sad.. Only when there is a general rejection of the errors of Vatican II sect and its false "pope" can we come closer to an imperfect general council electing a real Pontiff whom we can obey and call "our father." There is a movement by some, who are disgusted by the Vatican II sect, to join the Eastern Orthodox. The appeal is understandable. 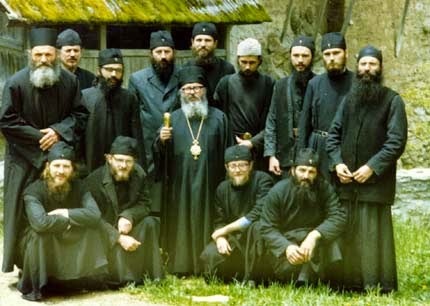 They have retained the beautiful Divine Liturgy of the East, they have retained all seven sacraments with a reverence for the sacred, and they are not plagued by the rampant sodomite/pedophilia scandal emanating from Modernist Rome. Now, there are even some who openly proselytize for the Orthodox. They talk about how they have stability and do not fight among themselves, unlike Traditionalists. They have "no use" for a pope either, and did you know that popes and Councils have contradicted each other prior to Vatican II? The Orthodox (noun) are truly orthodox (adjective)---so these apologists claim. 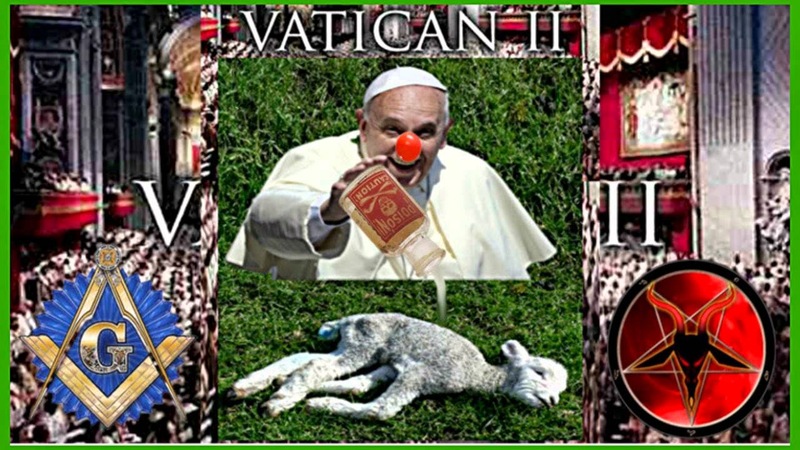 Traditionalists are either sedevacantists or sedeprivationists; both of whom deny that Jorge Bergoglio (Francis) is a true pope, but neither deny the institution of the papacy as defined by the Church's own approved pre-Vatican II theologians. As to Traditionalists having disputes (as to sedevacantism, sedeprivationism, "recognize and resist" of the pseudo-Traditionalist SSPX, etc) this is to be expected because when "the Shepard is struck, the sheep will scatter" (See Zechariah 13:7). For the record, I do not consider conclavists (those who believe they can just go out and "elect" a so-called "pope") to be Traditionalists. They adhere formally to a false pope, the same as members of the Vatican II sect. This post will sketch the controversy surrounding the "Filioque" which the modern day Orthodox proselytizers use to batter Traditionalists. This is a condensation of the Church's Teaching as expounded by theologian Pohle. When the Macedonian heretics declared the Holy Ghost to be a creature of the Logos-Son, the Second Ecumenical Council (Constantinople I--381 A.D.), in order to safeguard the dogma of His Divinity, thought it was sufficient to affirm His Consubstantiality (of the same substance) with God the Father in the phrase "Qui ex Patre procedit" ("Who proceeds from the Father"). Sometime after the Council, certain heretics came to believe that "ex Patre" ("from the Father") meant "Ex solo Patre" (from the Father alone"). It was left to the heretical Patriarch of Constantinople, Photius, to raise the banner against the Church for inserting the word "Filioque" into the Nicean Creed. A great council (non-ecumenical) was held in Constantinople in 879 A.D. which was attended by 380 bishops of the East and formally pronounced sentence of anathema against all who should add to, or take from, the Creed of Nicea. Though the Ecumenical Council of Chalcedon (451 A.D.) had forbidden the reception into the Creed of "any other Faith" it can only have meant heterodox additions. The First Council of Constantinople would add many clauses expanding the original Nicene Creed, including clauses that state the Holy Ghost "proceeded from the Father" (as explained above), and "I believe in One, Holy, Catholic, and Apostolic Church." Thus history proves there was no absolute ban on doctrinal clarifications considered necessary to combat serious errors. I find it supremely ironic that the Latin text of the Creed with "Filioque" has retained "Theon ek Theon" ("God from God") while the Greek text used by the Eastern Orthodox has eliminated those words from the very Creed they claim cannot have ANY change! They stand condemned by their own invented principle! Sacred Scripture expressly mentions only the procession of the Holy Ghost from the Father. (See St. John 15:26) However, the Procession of the Holy Ghost from the Son can be proved by a three-fold argument from Biblical texts. In the New Testament, the Holy Ghost is not only represented as "the Spirit of the Father," but also as "the Spirit of the Son." (See Galatians 4:6, Romans 8:9, Phil. 1:19, I Peter 1:11). The Orthodox admit the only reason why the Holy Ghost can be called "the Spirit of the Father" (See St. Matt. 10:20) is because He proceeds from the Father. If this be true, it must be a pari concluded that He can be called "the Spirit of the Son" because He also proceeds from the Son. This conclusion is fortified by Christ being called "the Son of the Father" (Filius Dei) which evidently expresses a procession One from the Other. A stronger argument can be drawn from what is known as the "Mission" of the Holy Ghost. Missio, in the abstract sense, signifies "the procession of one from another by virtue of some principle and for the purpose of accomplishing some task." There are three essential notes of any mission, human or Divine: (1.) A real distinction between the sender and the one sent, for no being can send itself (2.) A certain dependency of the "sent" in regards to the "sender." (3.) A relation on the part of the "sent" to some place or effect. In the Divinity any influence of the "Sender" on the "Sent" --other than by relation of origin, would be repugnant to the Essense of the Triune God. The eternal Procession of one Divine Person from another may be called "Internal Mission" and the Temporal Mission is external and merely reflects the Internal. In Scripture, the Father is always represented as "sending" but never as "sent." The Son is both "sent" and "sending." The Holy Ghost is only "sent" and never "sending." The Son is sent by the Father, because the Son is begotten by the Father, not the Father by the Son; similarly, we read that the Holy Ghost is sent by the Father and the Son, because He proceeds from both the Father and the Son. (See St. John 14:16, St. John 15:26, and St. John 16:7--See also theologian Franzelin, De Deo Trino, thesis 33). In St. John 16:13 sqq, it is said that the Holy Ghost "hears" and "receives" His knowledge of the future from Christ. Now, one Divine Person can "hear" and "receive" from another only in so far as He does not, like the Father, possess His knowledge, and consequently His essence, from Himself, but receives it by way of of essential, eternal communication. Hence, just as Christ "hears" and "learns" from His Father only in so far as His Divine Nature with all the attributes of omnipotence, omniscience, etc, are communicated to Him by His eternal Generation from the Father; so, too, the Holy Ghost "hears" and "receives" from the Son only in the sense that all His knowledge and His whole Essence are derived through origination from Christ. Consequently, the Holy Ghost proceeds from the Son as well as from the Father. The Eastern Orthodox freely admit that the Latin Fathers unanimously teach the procession of the Holy Ghost from the Father and the Son. In making this admission, they condemn themselves. It is absurd to imagine that the Latin Church, which for eight centuries together with the East formed the One True Church of Christ, should have harbored and taught so disgraceful a heresy during all that time! In summation, do not be lead astray by those heretics calling themselves "Orthodox." Just as you can call an unborn baby a "product of conception," and it does not detract from his/her humanity, you can likewise call heresy "Orthodox," but it makes those who adhere to it heretics nonetheless. "The Quran should be the highest authority in America, and Islam the only accepted religion on Earth." Here In New York City, Mayor Bill de Blasio announced that the Big Apple would become the nation's first major city to close the public schools in observance of the two most "holy" days for Moslems, Eid al-Fitr, and Eid al-Adha. I wonder if Pope Pius XI, who composed the most beautiful prayer of the Consecration of the Human Race to the Most Sacred Heart of Jesus, could have imagined such a state of affairs. The prayer asks for the conversion of those "in the darkness of idolatry or of Islamism." (Of course the Vatican II sect eliminated the prayer which was ordered to be recited every October on the Feast of Christ the King). De Blasio is quoted as saying, "People who criticize it (the closing of schools on Moslem "holy" days), I think, should go back and look at the Constitution of the United States. We are a nation that was built to be multi-faith, multicultural." While it's true the US Constitution is full of Masonic ideals (like indifferentism--the idea that one religion is as good as another), I challenge anyone to show me where it states that we must give all religions the honor of holidays. It's probably written next to the part that states women have a right to kill their unborn children. What about holidays for Buddhists, Hindus, Wiccans, and even Satanists? Let's not forget that almost all of the people in the US in 1787 were professing some sect of Christianity (and some were members of the True Church as well), so it's obvious why Christmas and Easter were celebrated. The Constitution may allow you to honor what you like, but it does not enjoin official recognition. The Modernists and the political left are quick to brand any opposition to Islam a mental disorder, i.e., "Islamophobia," just as opposition to the sodomite agenda is "homophobia." The facts speak otherwise. Soon, the Moslems will overpopulate the contracepting Christians of the West, and accomplish what their huge armies in days gone by couldn't do. Ironically, what's happening now was condemned by Pope Gregory XVI in his encyclical Mirari Vos: "...and from this most putrid font of indifferentism flows that absurd and erroneous view, or rather insanity, that liberty of conscience should be asserted and claimed for just anyone." (Emphasis mine). Not only are we giving Moslems liberty of conscience, we're celebrating their false and evil holidays. If Frankie and the loony left-wing aren't stopped, soon we will be in a country dominated by infidels and forced to pay homage to the "martyrs" of 9/11. Traditionalism is controversial by nature. Trying to wake people up to the fact that Jorge Bergoglio is not really the pope will spark no little amount of contention. Add to this the fact that, without a pope, there are issues within Traditionalism which cannot be resolved since there is no one who can give a final and binding decision. "Roma Locuta Est, Causa Finita Est" (i.e. "Rome has spoken, the matter is concluded") is a thing of the past in a state of sedevacante. I don't believe in controversy for the sake of controversy itself. Unfortunately, there are those who do, and they relish attacking Traditionalist priests and bishops.These are not intellectual disagreements; instead they attack their character. True priests and bishops are not above reproach, and we must call them out on any major flaws so that a repeat of the 1950s " a cleric can do no wrong" mentality never again holds sway. However, to publicly attack a Traditionalist priest or bishop's orders without serious justification is not merely calumny, but a grave injustice to those Traditionalist Catholics who fearing that these priests and bishops may not be valid clergy, stay away from the sacraments. This is exactly what happened at the blog Pistrina Liturgica (hereinafter "PL"). For a detailed summary, please see my posts of 4/22/13, 6/8/13, 7/14/13, and 10/19/13. In short summation, the webmaster, who goes by the moniker "The Reader," possesses a near pathological hatred for Fr. Anthony Cekada and Bishop Daniel Dolan, whom he constantly refers to as "One Hand Dan." The reason? It is alleged that when Bishop Dolan was ordained to the priesthood by Archbishop Lefevre in the 1970's, he only imposed one hand on his head instead of two. Fr. Dolan was one of the nine priests who broke away from the Society of St. Pius X to found the Society of St Pius V in 1983. After Fr. Dolan left the SSPV in 1989 over the issue of the Thuc consecrations, the remaining clergy in the SSPV sent a letter to him asking him to refrain from all further priestly functions because the Archbishop's use of only one hand instead of two made his ordination "dubious." (Interestingly, they never brought this point up when he was with them, only after he left!). In addition to my posts mentioned above, Fr Cekada published a refutation of the idea that ordination with one hand was dubious in his article entitled "The Validity of Ordination Conferred with One Hand." It can be found at traditionalmass.org. After one of my readers sent a comment about the fact PL was now sending out a pamphlet, in Q & A format, attacking his orders yet again, I went on PL and began asking in the comments for the names of the witnesses of this alleged one hand ordination. I wouldn't give up after a massive back and forth of trying to dodge my inquiry. Without at least one witness, whose identity is known and has signed a sworn statement, the entire discussion about the validity of priestly ordination conferred with one hand becomes moot. Catholic theology DEMANDS that there is a presumption the rite was validly and correctly performed, whenever a bishop ordains a man to the priesthood. “When the fact of ordination is duly established, the validity of the orders conferred is naturally to be presumed.” (W. Doheny, Canonical Procedure in Matrimonial Cases [Milwaukee: Bruce 1942] 2:72.) That means everything was done correctly--matter, form, and intention. Those who wish to impugn the validity of orders have the burden to show, with credible evidence that raises a reasonable doubt, that matter, form, or intention was lacking. This they have not done. It turns out The Reader's lackey, "The Watcher" has a blog of his own, also bashing Bp. Dolan and Fr. Cekada entitled The Lay Pulpit (hereinafter "LP"). It was brought to my attention that in his post of 1/3/15, LP attacked me and attempted to defend PL's assertion about one handed ordinations. Neither one is able to grasp the relatively simple concept of "having the burden of proof." They seek to hurt Bp. Dolan by casting doubt on his orders, and by extension, the orders of any priest he ordains. This keeps good people away from the sacraments and hurts souls. I will reprint "The Watcher's" post from 1/3/15 entitled "A Moot Point" in red and will respond to each section below it without red color. A recent Pistrina Liturgica article -- in addition to a whole series of earlier ones -- has dealt with the doubts about Daniel Dolan’s one-handed ordination. In those earlier articles, Pistrina related how, after Dolan’s dubious ordination, nine priests (one-time colleagues of his) urged him to get those doubts resolved before continuing with his priestly duties, after which he responded by commissioning Anthony Cekada to write a tract arguing the validity of one-handed ordinations (which Pistrina then subsequently totally disproved and discredited). As you will see in my posts listed above, PL hardly can be said to have "totally disproved and discredited" anything. None of the nine priests who signed the letter were at the ordination. One of them, Fr. Joseph Greenwell, was 12 years old in 1976 and living in Kentucky. He even admitted he signed the letter because Fr (now Bp.) Kelly simply told him to do so. They state, as a matter of fact, that a one-handed ordination took place with no personal knowledge and they name no witnesses. The doubt exists only in the imagination. This recent article dealt specifically with a contention by one of Dolan’s supporters that there was an “eye witness” who swore “before God” that Dannie was ordained with two hands, not one. The problem is that this “eye witness” came forward to make his claim thirty-five years after the ordination – long after those nine priests had written their letter to Dolan. Why, one might ask, didn’t he come forward then? Pistrina pointed out this and several other problems with this “witness’s” account (which are detailed in the article). Nevertheless, Bp. Dolan has a known, sworn witness that the ordination was done properly according to the rubrics. PL has nothing but conjecture from nine priests who weren't there and have no witnesses. PL claims to have witnesses (or witness, singular, depending on what things he wrote at different times) yet refuses to name them (or him/her). So what proof of a one handed ordination does PL have, ladies and gentlemen? None. In response to this article, one of Dolan and Cekada’s supporters – one “Introibo” – wrote in as a “commenter” to challenge what Pistrina had to say. Introibo started by saying that the nine priests’ testimony itself was fourteen years after the ordination, making it subject to doubt as well (strangely, though, he did not raise the same objection about his “witness’s” words, which were thirty-five years after the fact). In the ensuing marathon of comments, Introibo, who happens to be a New York lawyer, went on to claim that he had a hard-and-fast witness, whereas Pistrina had none; and, being a lawyer, he then went on to claim that Pistrina had “no case” at all. After repeated calls by Introibo for Pistrina to produce a “witness,” Pistrina responded by saying that there were witnesses to the one-handed ordination, but that they do not, for their own private reasons, wish to be identified – and hence, Pistrina is not at liberty to reveal their names. Whereupon, Introibo, being a lawyer, seized upon this to contend (since Pistrina could not produce their names) that they did not exist -- and that Pistrina was lying about them (and everything else). It's plain logic that if you can impugn the reliability of a witness based on the length of time that passes between the event and his testimony, the fourteen years that passed between the ordination and the priests' letter make it as unreliable as the statement from the witness thirty-five years after the fact. Bp. Dolan's witness was actually there at the 1976 ordination. The nine priests were not there and never even claimed to have any first hand witnesses. Which would you consider more reliable; a sworn statement from someone who was there at the event 35 years ago, or a letter written by nine priests 14 years after the fact and based on hearsay? I didn't raise any doubt about Bp. Dolan's witness because he doesn't even need one. I never claimed "I" had a "hard and fast witness." No witness is necessary because under Church Law the burden of proof is on the one seeking to cast doubt upon the validity of the sacrament. If there were truly witnesses to a one-handed ordination, and they believed that this could raise doubt as to the validity of the sacrament, they have a grave duty in justice to make what they saw public. It would be sinful to withhold such information regarding validity when the salvation of souls could literally hang in the balance. Yet, for "private reasons" they will refuse to be identified. How convenient! All of them have compelling "private reasons" that surpass the duty to save souls! Remember that "Salus Animarum Est Suprema Lex" ("The salavtion of souls is the supreme law"). In the civil law, you have a Constitutional right to both know and confront any/all witnesses against you. The Confrontation Clause of the Sixth Amendment to the United States Constitution provides that "in all criminal prosecutions, the accused shall enjoy the right…to be confronted with the witnesses against him." In the absence of such confrontation, the witnesses testimony will be considered non-existent. In the instant case, we don't even know if such witnesses are real, let alone confronting them. 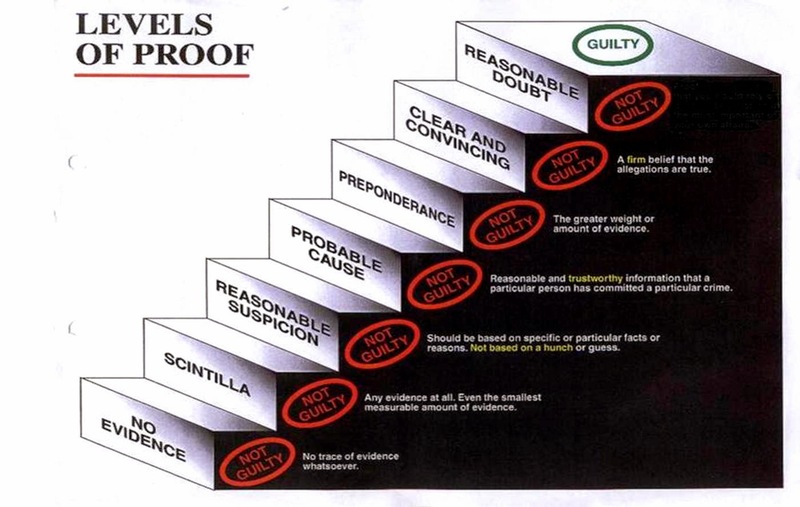 The burden of proof must be high in Church Law as in criminal cases. Why? Can you imagine the bedlam if the Church allowed anyone who claimed without proof that "someone saw something" to call into question the validity of a sacrament? True Catholics must be morally certain that the sacraments they receive will be valid, unless there is credible evidence to the contrary. How credible are nameless, faceless "witnesses" to you? There's more credibility in the man on the old Art Bell show who claims reptilian aliens in human form are controlling the world--- and he has witnesses--- but they can't speak or the aliens will kill them. If PL will cast doubt on the validity of the orders of a cleric based on conjecture, hearsay, and "secret witnesses," could you reasonably believe anything else he has to say about Bp. Dolan? What Introibo failed to realize (or did not want to realize) is that there was no mention of such “witnesses” in the original Pistrina article – because there was no need to. No such “witness” was necessary to prove doubt. The fact that nine priests wrote to Dolan about his ordination being doubtful (and urging him to do something about it) was proof enough that a doubt existed. And the Pistrina article addressed that doubt. Another problem with Introibo’s “witness” is that he was the only one to make such an affirmation. That, coupled with his Johnny-come-lately timing and his over-the-top rhetoric, strongly hints that it was braggadocio, not fact – and it is our belief that, one day, this “witness” will suffer much embarrassment for having done this bit of damage control for Dannie. The fact that nine priests wrote a letter does nothing to give rise to doubt and overcome the presumption of validity---that everything was done correctly---enjoyed by Abp. Lefebvre. On what evidence is this doubt based? There is no evidence. None of them were there. None of them even claimed to have witnesses. If those same nine priests were to sign a letter stating that Elvis Presley was alive, does this induce a "doubt" as to Mr. Presley's death? Obviously not. The doubt must be reasonable, i.e. based on credible evidence. There is no such credible evidence backing up the letter of the priests. Secondly, alleged problems with Bp. Dolan's witness don't matter. The bishop is the one who needs no witness, because the Law of the Church clearly places the burden of proof on PL. The Watcher would reverse the burden of proof, contrary to Church teaching. It must too be pointed out out that Pistrina never stated that Dolan’s ordination was invalid (although Introibo and other “anonymous” commenters claimed it did); it only said that, since the ordination’s validity was in doubt, Dolan should take the safe path of removing that doubt by undergoing conditional ordination (as the Church has always prescribed in such cases). Dolan, of course, did NOT take that path, but instead commissioned Anthony Cekada to write his lengthy tract “proving” the validity of one-handed orders – which, of, course, it did NOT. It was a totally flawed mish-mash of mistranslation, faulty logic, and misquoting of official papal teaching; in short, it was a pack of lies. But for some number of years, Cekada’s error-filled “explanation” was accepted by everyone (including those nine priest who had written that letter to Dolan). But persistent doubts about it kept surfacing. Then one day, a year or so ago, this same Introibo – because he was irked by Pistrina’s often referring to Dolan as “one-hand Dan” (a moniker, by the way, coined by one of Dolan’s former colleagues), challenged Pistrina to prove that one-handed ordination is doubtful. Sorry, but claiming that someone's orders are doubtful has no difference in practice from claiming invalidity. The result is the same: you must stay away from those putative sacraments. If there is a priest known to be invalid (ordained in the Vatican II sect), you must stay away from him if he converts until he has been validly ordained in the Traditional Rite of the Church. What if he was ordained in the Traditional Rite, but it is reported by many known witnesses declaring under oath that the bishop garbled the words of the preface containing the form? He would be dubiously ordained. You must stay away from him unless/until the ordination is conditionally repeated because he might not be a priest. You cannot risk idolatry by worshiping what might be mere bread. Therefore, any semantics about "doubtful" vs. "invalid" is disingenuous. Second, without positive doubt based on credible evidence the ceremony is presumed valid and there is no "safer course." Third, read Fr. Cekada's monograph as well as my posts. The case for validity of one-handed ordinations is a far cry from "a pack of lies." The same cannot be said for PL and LP. Well, Pistrina did just that – and in a thorough and decisive way. And it is ironic (and appropriate) that it was Introibo, who, in issuing this unsolicited challenge, tried to discredit Pistrina and conversely vindicate his hero Dannie -- but accomplished just the opposite. And it is now doubly ironic (and understandable) that this same Introibo – with his comments on the recent Pistrina article (and a subsequent article, by the way) – has come forward once again to argue that this Johnny-come-lately “witness” is, nevertheless, a witness (and that Pistrina had failed to produce one). But his point is moot – and for more reasons than one. PL can't even get to first base by overcoming the presumption of validity, let alone prove one-handed ordination invalid in a "thorough and decisive" way. I have no "hero" in Bp. Dolan--or any other cleric. I follow the evidence where it leads. PL and LP have none. For the record, I never even met Bp. Dolan. The whole debate about one-handed ordinations being doubtful or not is moot! If you can't prove a one-handed ordination happened--or it is more likely than not to have happened--Church Law (and common sense) tell us it didn't happen. First off, as Pistrina has tried (in its numerous responses to him) to explain to him over and over again that the issue is NOT about identifying or producing “witnesses” (and certainly not about claiming that Dolan’s ordination was invalid), but only about showing that there was doubt about that validity – enough doubt to prompt not only a letter from nine priests (including Dannie’s buddy Don Sanborn), but also a lengthy (and flawed) response (by Anthony Cekada) to that letter -- both of which are more than ample evidence of that doubt. The vast majority of traditional clergy, then and now, understands that there was and continues to be doubt (and now so more than ever). And, despite Introibo’s contention that it did not fit the legal definition of reasonable doubt, it was “reasonable” enough for those nine priests (as it is for the vast majority of traditional clerics) – and definitely genuine. And Introibo’s unceasing efforts to downplay or de-legitimize that doubt only betray his bias – and an ulterior motive for saying what he did. It is about witnesses to overcome the presumption of validity Apb. Lefebvre enjoys and introduce reasonable doubt, thus carrying your burden of proof under Church teaching. Nine priests had no problem with Bp. Dolan from 1976 until 1990, the year after he broke with them. The nine priests saw nothing because they were not there. They list no witnesses nor did they ever claim to have any. People can doubt anything. There are people that doubt the moon landing occurred. You can doubt the death of Elvis, and doubt the Earth is round. None of these doubts is REASONABLE, because they are assertions unsupported by credible evidence. If, in pre-Vatican II days, you went to the Holy Office and told the Cardinals there assembled that you doubted a cleric's ordination was valid because a one-handed ordination took place (based on alleged testimony from secret witnesses), what do you think they would do? Throw you out, lecture you on calumny and gossip, and admonish you for wasting their time! Notice the phrases "vast majority of traditional clerics" (like whom?) and "definitely genuine" (according to what established facts in evidence)? Secondly, Introibo’s point is moot because the really salient point about all of this is not so much the doubt about those orders, but Dolan’s being too ARROGANT to remove that doubt – by taking the safe, prudent course of getting conditionally ordained. Everything else is moot. Everything else is irrelevant. Conditional ordination was (and still is) the obvious (and common sense) thing to do. It would have been so easy, so painless. Had he done it, it would have displayed so much humility and good will on his part – and, in a single stroke, it would have put an end to all doubts about his orders. But to do so requires humility and charity – in both of which Dolan is sorely lacking. So, in lieu of taking that quick, easy step, he instead had his buddy Tony compose a lengthy (and now totally discredited) treatise arguing the validity of one-handed orders -- which makes one wonder why he went to all that trouble to avoid a simple fix. Why "remove" a doubt that doesn't exist? You mean every time some whacky character says he doubts a sacrament was valid, it must be repeated? That's a sacrilege and would scandalize (unnecessarily) those good Traditionalists that went to Bp. Dolan and his priests, that perhaps the sacraments they received were null and void. It has nothing to do with a lack of humility and everything to do with good judgement not to "fix" something that was never "broken" in the first place! "Common sense" is something to which PL and LP are strangers. For the record, Fr. Cekada, who was present at the 1976 ordinations has affirmed since the letter of 1990 that two hands were used, and Bp. Dolan also has denied one hand was used. Please do not be afraid to avail yourself of the sacraments from Bp. Dolan or the priests he ordains based on some calumnious "doubt." At the blogs The Lay Pulpit and Pistrina Liturgica, you'll find a "Watcher" and a "Reader." Unfortunately, you'll search in vain for a "Thinker" or a "Truth Teller."